In a recent interview, Kevin Trenberth, Distinguished Senior Scientist, from NCAR said the upcoming 2014/15 El Niño might shift global surface temperatures upwards by 0.2 to 0.3 deg C to further the series of upward steps. Curiously, Trenberth is continuing to suggest that the warming we’ve experienced since the mid-1970s resulted from naturally occurring, sunlight-fueled El Niño events and that we might get to experience yet another of those El Niño-caused warming steps as a result of the 2014/15 El Niño. So let’s take a look at what he’s suggesting and what the future MAY POSSIBLY hold in store…if Trenberth’s dreams come true. One of the real prospects to look out for is whether we go back into a different phase of this Pacific Decadal Oscillation. And one of the potential prospects we can watch out for is whether the next whole decade will be distinctly warmer…uh, uh…and so, in terms of the global mean temperature, instead of having a gradual trend going up, maybe the way to think of it is we have a series of steps, like a staircase. And, and, it’s possible, that we’re approaching one of those steps. And we will go up, you know, two- or three-tenths of a degree Celsius to a next level, and maybe we won’t come down again. I think that’s one of the things we could possibly look out for. Some of you may believe that Kevin Trenberth is actually looking forward to another upward step…not just looking out for one. So let’s take another look at the upward steps in global surface temperatures he was happily discussing. Trenberth is now suggesting that global surface temperatures might shift upwards 0.2 to 0.3 deg C again in response to the 2014/15 El Niño. So for illustration purposes only, let’s take the data from the 16-year period of 1998 to 2013 and shift them up those 0.2 and 0.3 deg C and insert them in the time period of 2015 to 2030. See Figure 2. The period-average temperature anomaly of 0.57 deg C for the period of 1998-2013 would shift up to 0.77 deg C or 0.87 deg C for 2015-2030. WOULD AN UPWARD STEP HELP THE CLIMATE MODELS? An upward shift in global surface temperatures would definitely help the models for a few years, but, because the global surface temperatures warmed in a step, the hiatus period that followed would again cause a continued divergence between the models and the real world. 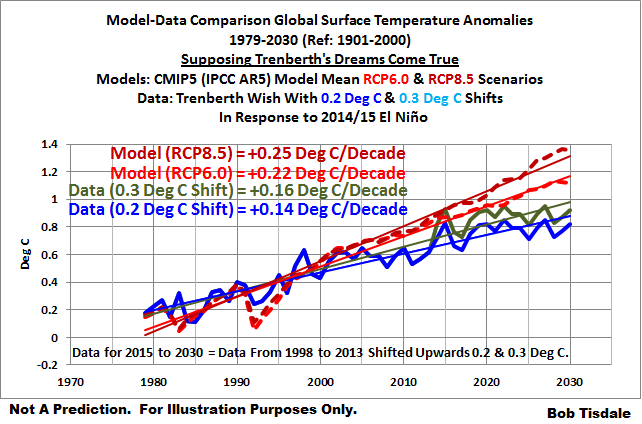 See Figure 3 for a model-“data” comparison starting in 1979 and running through 2030. The graph includes the multi-model ensemble-member mean for the climate models stored in the CMIP5 archive, with two scenarios: RCP6.0 and RCP8.5. And the two sets of future “data” are created once again by taking the NCDC global surface temperature anomalies for the 16-year period of 1998 to 2013, shifting them up 0.2 to 0.3 deg C and inserting them in the time period of 2015 to 2030. 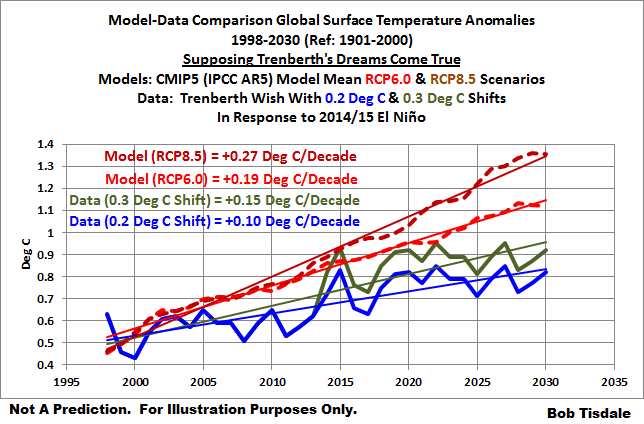 Figure 4 includes the same model-data comparison but with the commonly used start year of 1998. 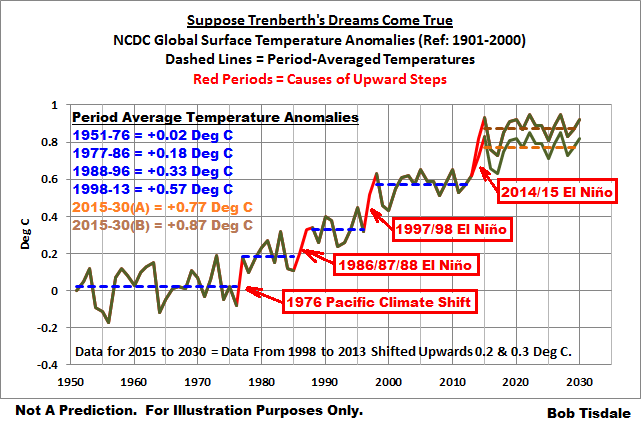 Kevin Trenberth appears to have conflicting causes for the global warming we’ve experienced since the mid-1970s. On one hand, for decades, Trenberth has been a true-blue proponent of the hypothesis of human-induced global warming, with the warming caused by the emissions of manmade greenhouse gases. On the other, for about a year, he has been promoting the “big jumps” in global surface temperatures, with the steps in the staircase of global surface temperatures being caused by El Niño events. Typically prior to an El Niño, in La Niña conditions, the cold sea waters in the central and eastern tropical Pacific create high atmospheric pressure and clear skies, with plentiful sunshine heating the ocean waters. The ocean currents redistribute the ocean heat which builds up in the tropical western Pacific Warm Pool until an El Niño provides relief (Trenberth et al. 2002). And we confirmed in the post Open Letter to the Royal Meteorological Society Regarding Dr. Trenberth’s Article “Has Global Warming Stalled?” that it is sunlight that provides the warm water that serves as fuel for El Niños. Those are curious statements. Trenberth has never taken the time to explain that we would NOT expect the surface temperatures to go back down again. So his “never go back to that previous level again” seems to be a clear case of misdirection. according to Trenberth and Fasullo (2011), an El Niño causes changes in atmospheric circulation that reduces the evaporation from the Atlantic and Indian Oceans and allows more sunlight to penetrate and warm those ocean basins to depth, both of which contribute to the warming of the Atlantic and Indian Oceans in response to an El Niño without the direct exchange of heat from the tropical Pacific. Meanwhile, maximum warming of the Indian and Atlantic Oceans occurs about 5 months after the El Niño owing to sunny skies and lighter winds (less evaporative cooling), while the convective action is in the Pacific. The upward steps are precisely what we would expect of ENSO if it is viewed, not as noise in the surface temperature record, but as a chaotic, sunlight-fueled, recharge-discharge oscillator. It appears that El Niño events, combined with the heat uptake in the tropical Pacific during La Niña events, are major contributors to any radiative imbalance that may (or may not) exist. The climate science community hasn’t bothered to properly account for the contribution of ENSO. And there’s no reason that we would expect them to do so. Any attempt by the climate science community to account for ENSO’s contribution to the warming of surface temperatures and the oceans to depth would detract from the hypothetical influence of manmade greenhouse gases. Having actually conducted the interview you quote here, I find your rendition of Dr. Trenberth’s views deliberately distorted and all but unrecognizable. Fail. greenman3610, thanks for the laugh. I quoted Trenberth chapter and verse. There’s no distortion on my part. You’re viewing what Trenberth told you through infrared-colored glasses, which is not the real world. Sorry to burst your bubble, but that’s what bubbles are for. greenman3610, it seems to me that Bob just filled in what Trenberth left out in order to put things into perspective. Bob doesn’t contradict nor distort Trenberth; he uses the same data Trenberth uses. I’ll get to work and update your graphic (Figure 1) in my climate pages today. Trenberth’s view seems very limited. If heat is stored in water, which can store a lot of heat, and that heat is transferred to the atmosphere, it must ultimately be a heat loss for the planet in the long term, since the heat leaves the planet in the short term. Note. Only half the ENSO models are currently predicting an el Nino. Neil, this will be an interesting year to watch. Hi Bob, Are there any data bases on cloud cover over the tropical Pacific? It seems the global warming is caused by ENSO and the extra heat is provided by the sun. So we should perhaps see a reduced cloud cover, on average, and hence more sunlight from the early seventies up to 2000 and perhaps more cloud cover and less sunlight since then. I would appreciate getting your view on this. There are two things to concern yourself about with the ISCCP data. They may be biased by the volcanic aerosols from El Chichon and Mount Pinatubo, so I typically only look at the data after the mid-1990s, and there’s a dead spot before about 1999 over the Indian Ocean. Bob, there are a few simple issues with your analysis. 2) You assume a “hiatus” like behavior similar to that of 1998-2013, but unless the 2014 Nino is as super as 1998, that’s unlikely given the additional forcing in the next decade. 3) You the IPCC models with some of the quickest CO2/CH4- which is not consistent with observations. Andy, and there is a very simple issue with your comment. I made no analysis. I made no prediction. I simply presented a “what if” situation to illustrate what a “Trenberth jump” MIGHT look like. You’ve read way too much into my simple presentation. Regarding your item 3, I believe you need to study the RCP6.0 and RCP8.5 scenarios. Are you aware they include “historical” forcings until 2005 and that they are projections beyond that point? That indicates your “is not consistent with observations” is wrong. Are you aware that RCP6.0 is very similar to scenario A1B, which was the primary scenario used for projections in the IPCC’s AR4? Are you aware that RCP8.5 could be considered the “business as usual” scenario? Bernd Palmer says: Bob doesn’t contradict nor distort Trenberth; he uses the same data Trenberth uses. That’s hard to believe, if you actually follow what Trenberth says. 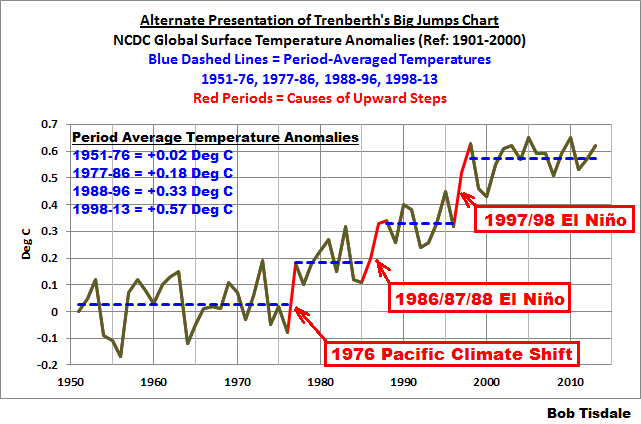 Trenberth plainly believes both that the global warming is caused by CO2 and that the jumps in surface temperatures can sometimes be attributed to El Nino events. These are not conflicting: it’s a noisy phenomenon (ENSO) superimposed on a upward trend (CO2). That ENSO also has its own periods of increased/decreased warming is no surprise. I’ve never heard Trenberth say that these periods (of more/less clouds) were responsible for the upward trend in surface temperatures, so acting like Trenberth believes this is indeed a “distortion”. I think Bob is interpreting Trenberth’s words in the way that is most favorable to Bob’s hypothesis, and in doing so, creating a contradiction in Trenberth’s views that doesn’t actually exist. What would make more sense is to interpret Trenberth in the way that’s most consistent with other stuff Trenberth says. 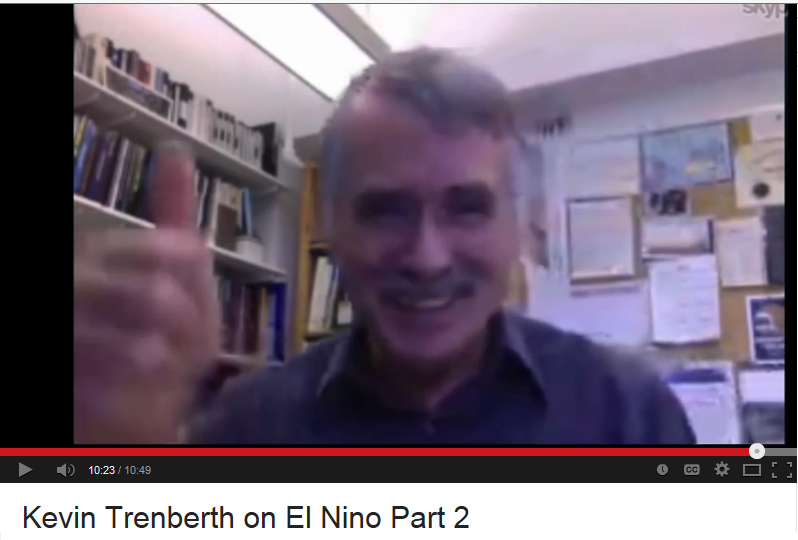 That gives you a view of Trenberth that’s pretty much standard AGW. BobTisdale says: There would be no conflict if Trenberth was able to show that manmade greenhouse gases somehow contributed to the warm water that fuels El Niño events. Yes, if only someone had bothered to figure out how greenhouse gases could help the atmosphere retain heat, and in doing so, warm the ocean surface. =p. You suppose there’s anything like that in the literature? And, Windchaser, thanks also for quoting me out of context toward the end of your comment. Did you read the portions of the two Trenberth papers I quoted, regarding sunlight? Did you understand them? Do you understand the satellite era sea surface temperature record? Do you understand the ocean heat content data for the tropical Pacific? Your beliefs in the impacts of hypothetical human-induced global warming are not supported by ocean heat content data or satellite-era sea surface temperature data. Please take them to RealClimate or SkepticalScience where they’ll be appreciated. There could be a weak nino but I am still not seeing the conditions (yet) for a strong one. Some slight reversal of the trades in the far western Pacific but still nominal, more or less, everywhere else. In fact, it is quite possible that the equatorial pacific warming has already peaked. We’ll have to see how it plays out. Pingback: Open Letter to Miriam O’Brien of HotWhopper (a.k.a. Sou) | Watts Up With That?